This topic covers how to create weighted or unweighted assignment categories in a class. Select a class to view settings for that class. Select Settings on the left sidebar. 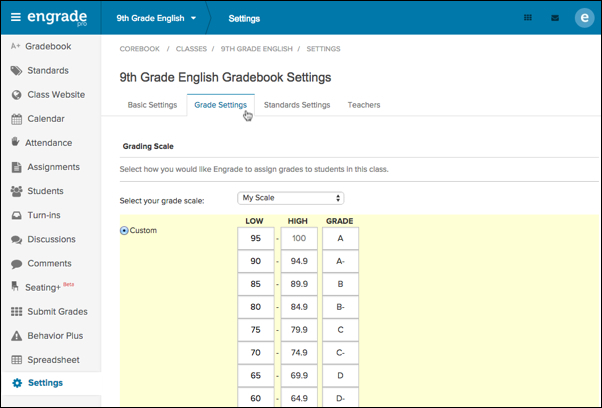 Select the Grade Settings tab. Under Assignment Categories, enter the desired assignment categories for your class. For example, you may want to set classwork, homework, and tests as categories for your assignments. Note: Assignment Category names can be a maximum of 30 characters in length (including spaces) and should consist of letters and numbers. To add more than 5 categories, select Add category. You may add up to 15 categories. To weight your assignment categories, select Yes next to Weight assignment categories? Type in the weights you would like to use to the right of each category. The weight percentages must add up to exactly 100%. Once weighted categories are set for a class, they should not be adjusted later in the school year as this will retroactively change students’ grades in previous marking periods. Once you have made all of your desired changes, select the green Submit button to save.